QUICK COURSE DESCRIPTION: For most writers most of the time, the villain arrives as an afterthought. To write compelling fiction that keeps readers coming back, building the right conflict --- and the right character to drive your conflict --- is where you start. You can maintain control of your villains, make them convincingly evil, and use them to tell the stories YOU want to tell. As I update this, I'm well into Lesson 6. I try to write material that is based on fundamentals, and make each lesson's content evergreen, but from time to time, things change. While I'm not expecting any changes in the nature of villainy, or any new twists on evil, I could be wrong. But the first version of the class will contain typos, spellos, and things that cause a lot of questions in the forum that require me to add materials to the lesson later. Hence, SPLINTERS. First, How to Write Short Stories, and then How to Write A Novel. I have strong incentive to bring this in at the allotted number of lessons. So what will it cover? 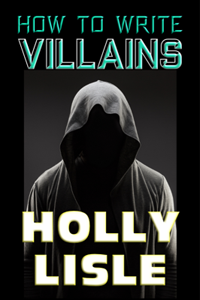 Do You Need An Antagonist, a Bad Guy, or A Villain, and If You Need a Villain, What KIND Do You Need? This seems like it ought to be pretty simple. Good guys do good things, bad guys do bad things, and villains do evil things. This week, you're going to do work with the differences between what people think, what they say, and what they do, and how you can USE these in fiction to show the reader what you want him to see while saving some surprises for later -- WITHOUT cheating him. You'll be doing a lot of writing -- and seeing a lot of progress in your quest to get better villains into your fiction. This week, we're delving into sympathy and empathy, how to apply each to your villains (and why you might want to avoid writing villains empathetically), the three-step process for creating a sympathetic villain, the dangers when creating empathetic villains (the big one being a special-case appearance of that writing nightmare, You can't know what you don't know), and a trip through How to Break Your Sympathetic Villain and Make Your Reader Hate You, Too. Create at least ONE, and up to three, empathetic villains. Post a poll to determine Sympathetic or Not Sympathetic. This week we're going to look at all parts of the story villains can inhabit, and the viewpoints they can use to inhabit them. We'll work on villains voices, and on moving your villain smoothly from backstory to foreground as you get deeper into the work -- and we'll cover how to move a main villain from deep backstory to main story over the course of a series. You'll be working with third person past and present and first person past and present, and learning when and WHY you use each of these voices -- and danger areas to avoid. And you'll be doing a lot of writing. In this lesson, you'll be working on creating representations of evil that fit the world you've built. Evil in a magical world filled with elves and dragons looks very different than evil in a world filled with Artificial Intelligences and run by a Central Computer. And there's a big difference between Evil as Art and Evil as Science. So this week you'll be learning to how to recognize and define Science Villains and Art Villains, and then how to create both types, along with using techniques to shape your worlds to fit them. This is the one category only briefly touched on in the questions, but as someone who's written some pretty horrific villains -- and done it well -- I have to note that there's a toll the writer pays for writing villains that you don't for writing bad guys. It'll depend on you, of course, but I've had to walk away from stories for a while after writing a particularly tough scene -- the one with Danya at the midpoint in Vengeance of Dragons that broke me for longer than my deadline would accommodate, and I had to get back to words before I was ready. So this is going to be a pretty personal finale to the class. To write really villainy and real evil, you have to show the reality of it. And at least while you're writing it, if you're going to write it well, you have to live inside it. This is... not fun. It's fun to write good guys. It's frequently at least a little fun to write bad guys. If you're doing over-the-top villainy, that can be zany and enjoyable. If you're writing real evil, though? No. You want to take a lot of showers afterwards, and you avoid mirrors for a bit. I'm more than halfway through the call, and still doing about a lesson a week. Below is my working outline for what the class includes. The first lesson and worksheet, the forum and classroom are all in place, and class is starting now.